R4 Questions For "The Cove"
Compare and contrast the documentary style of film vs the traditional style of regular movies. List some of the differences. List some of the similarities? "The Cove" Question #2 Part of the problem? Considering what you now know about how dolphins rely on their sensitive sense of sound, A) how do you feel about "swim with dolphin" programs & dolphinariums such as Seaworld? B) Does it change your attitudes or actions in regards to visiting them knowing that the dolphins are in such a stressful environment? Documentaries rely very heavily on the interview to communicate important aspects of the story. When you are watching "The Cove", pay special attention to the interview techniques that are used. Ask yourself and answer the following questions; Where is the cameraman positioned? Where is the person being interviewed looking? "The Cove" Question #4 Morally Right or Wrong? If organizations (seaworld, swim with dolphin programs, etc.) purchase their dolphins from the Taiji dolphin drive as "The Cove" producers claim, are they morally or ethically responsible for the 23,000 dolphins slaughtered each year as well? Explain your answers. Music plays a vital role in setting the mood of any film. Explain how the musical soundtrack by composer J. Ralph helps or hurts this film. What kind of moods were created? How and when did they use the music to enhance the message of "The Cove."? (pay special attention to the music played while the dolphins are in the cove vs. the music played while they are swimming freely in the ocean.) Explain your answers. "The Cove" Question #6 "You Eat Cows, We Eat Dolphins"
"You eat cows, we eat dolphins" is a quote from the movie which is cited as one of Japan's defenses. Do they have a point? Do you agree or disagree with this defense? Explain your answer. "The Cove" Question #7: Both Sides Of The Story? 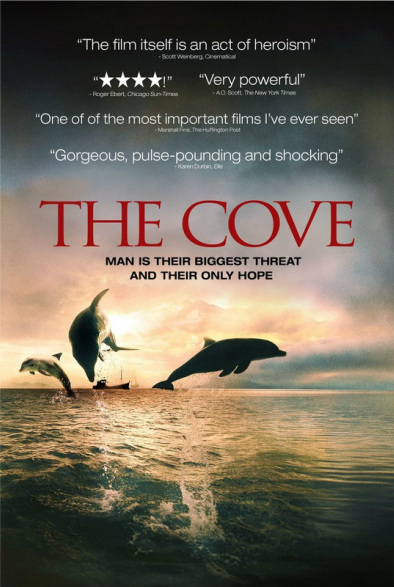 Overall, do you feel that "The Cove" is a fair documentary (so far)? In other words, do you feel that both sides of the story are being told? Are the Japanese people/government/fishermen being portrayed fairly or unfairly? Explain your answers. "The Cove" Question #8 "Your either an activist or an in-activist"
Cove Director Louie Psihoyos states that "Your either an activist or an in-activist" He also expresses concern that the older generations of people who are trying to make a difference (Ric O'berry, Roger Payne etc.) will not be around forever and that there may not be a younger generation that will step up to fill their shoes. Do you agree or disagree with his concerns. Will your current generation be more concerned with their texting, iPhones, Xbox, laptops etc. or will they step up to make a difference on the important social and environmental issues that are out there? What was your immediate emotional response immediately after the film ended? In other words, what emotions were you feeling? (Not what you "thought", but how you "felt") Please explain. "The Cove" Question #10 "Media Manipulation"
The art of filmmaking can also be called the art of manipulation. A great filmmaker knows how to manipulate his/her audience. In a traditional film, the audience usually understands that what they are watching is not reality, not absolute truth. However this is not always the case in regards to documentaries. People often feel that what they are watching is real factual and free of manipulation. Do you feel that the makers of "The Cove" manipulated you in any way? If so, how? "The Cove" Question #11 "Great documentary .... or not?" "A good documentary should entertain/inform/persuade. It’s one thing to cover an issue of great importance in the world, but if you’re film is boring, you’re not doing a good job and not only will your film see less widespread attention, it may even be shunned for how bad it is. It must have entertainment value to it. On top of this, you want a film that can inform. This means credible information about the chosen topic that educates and helps people understand truths that were previously unknown. And along with entertainment and information, the film must be persuasive. It has to display a clear theme, or message, and this must make people re-think their own actions or re think your topic at the end of a movie. It is key that upon your film’s ending; the viewer sees the world in an entirely different way. This is obviously dependant on the subject matter, but nonetheless you want them to successfully receive your message and maybe even do something about it. Documentary producers all have different motives when creating their works. Some may want to entertain while some strictly inform, but nonetheless all judging criteria incorporate balance and therefore you must consider all three of these as crucial." Based on this criteria was "the Cove" a great Documentary? Was it persuasive? Was it credible? Was it entertaining? Do you see the world in a different way? Explain.